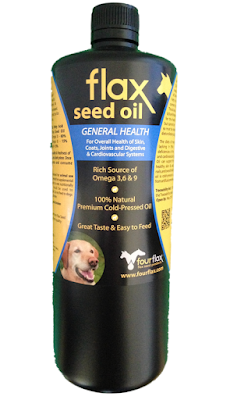 Fourflax Flax Seed Oil is a 100% natural premium cold-pressed oil used as a food additive for dogs (and also horses). Also called linseed oil, flax seed oil is derived from the seeds of the linseed crops and has been used as a more aesthetically pleasing alternative to fish oil supplements (which may impart a fishy smell to the breath or skin). Most pet foods and pet treats are manufactured to have a high quantity of Omega 6 fatty acids much less Omega 3 fatty acids because of the cost involved in manufacturing pet food. It is this lack of Omega 3 that is often cited as the cause for several inflammatory conditions such as arthritis, skin problems and allergic reactions. It is believed that an approximate ratio of 5:1 of Omega 6 to Omega 3 fatty acids is essential in promoting health and maintaining homeostasis in your pet's body. Therefore, it is important to supplement most pets on commercial pet food with quality Omega 3 fatty acid supplements, which can easily be added to your pet's food bowl or given in a small amount of a treat. Even with self-labelled super premium foods, the product is often advertised as containing Omega 3, however both the exact amount of Omega 3 and details of the source are rarely published. 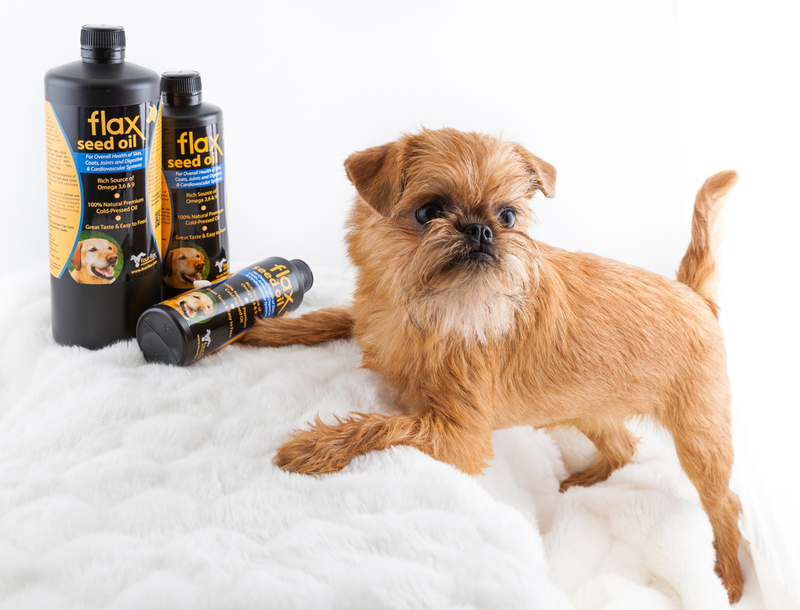 Supplementing your dog's daily feed with Fourflax Flax Seed Oil can help rectify the imbalance of Omega 6 and 3, prevent and treat all sorts of inflammatory conditions, as well as support your dog’s immune, circulatory and digestive systems. The oil contains 60% Omega 3, 15% Omega 6 and 15% Omega 9. It is processed in Canterbury, New Zealand in exactly the same way as the manufacturer’s food grade oils and therefore meets food grade standards. Fourflax Canine Flax Seed Oil is palatable and very easy to add to your dog’s daily feed as the bottles come with pourers in the lid. The suggested daily feeding rate is 1ml of oil per 2kg of body weight as a starting point which will help your dog to adjust to the oil. The product promises to deliver visible results within 10-14 days, as long as the oil is fed every day. The coat will be softer and shinier, and if your dog was suffering with a joint problem, you should see a difference in mobility. If you are treating a specific condition, such as a skin problem or allergies, then you may need to increase the amount that you feed after 2 weeks to see results, as the amount required depends on the severity of the condition. Please Note: if your dog has ever suffered from Pancreatitis or a Pancreatic condition then flaxseed oil should NOT be fed due to the fat content of the oil. Flax seed oil should be refrigerated to prevent rancidity. When kept refrigerated the oil will remain fresh and tasty for up to 3 months. The manufacturer’s website includes a handy daily Cost Calculator making it easy to decide what size bottle to choose (depending on your dog’s weight) and associated daily cost.